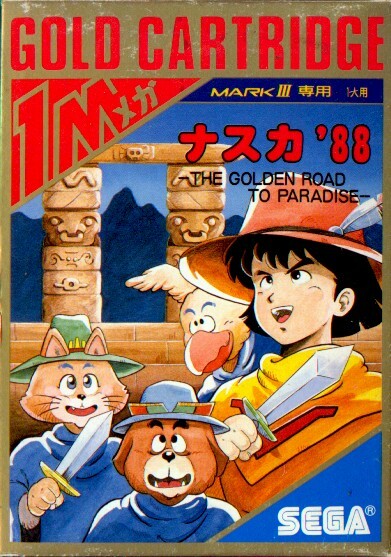 The cat looks like it was placed upon a person’s body and given an adorable hat and sword. Alex Kidd wandered into the wrong game. Sega’s knack for making off-beat console games continues with Aztec Adventure. 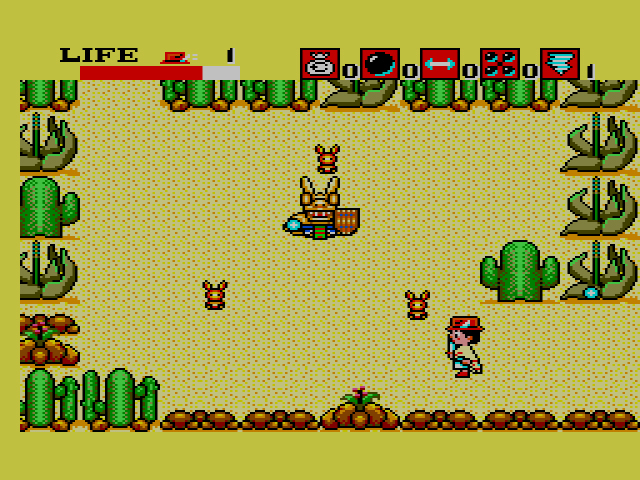 You control the explorer Nino and guide him through the harsh terrain of Mexico in search of Paradise. There are ruins to explore, deserts to cross, forests to hack down – all in the name of science and selfish gain! Nino is armed with a short-reaching machete (comparable to Link’s pathetic sword in Zelda II) to take down the demons that stand between him and Paradise, and sweet merciful heavens, are there a lot of them. Poor Nino isn’t able to move or attack very fast (all that fattening explorer cuisine), so your only hope is to keep hacking through the clutter and hope that you make it to Paradise alive. Nino has a solid life bar, but he only has three lives to use before his explorer bones join those who ventured before him. No password system, no continues, only a level select cheat which never worked when I tried to enter it in. The road to Paradise might be Golden, but it’s also fraught with peril and broken codes. 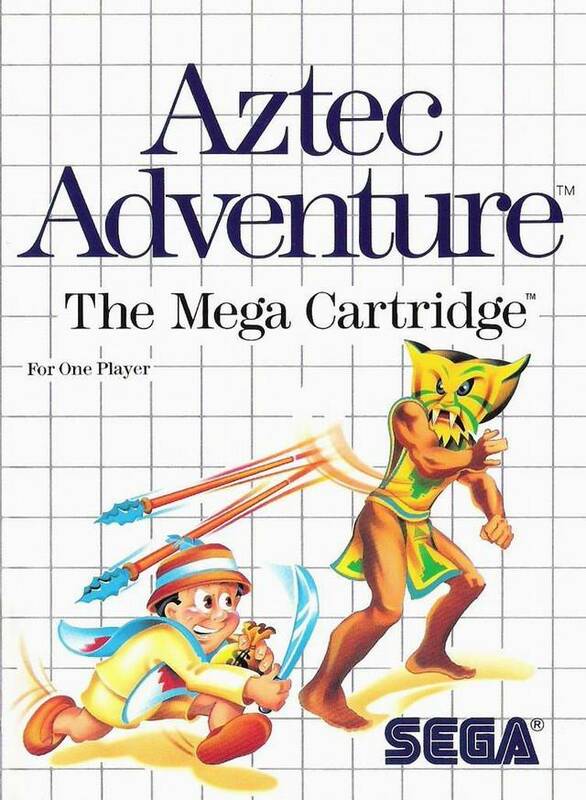 The levels of Aztec Adventure are called labyrinths in the manual, – a somewhat accurate term. The levels are linear – there’s very little off-the-beaten-path exploration going on – but the game guides you through the terrain rather than around it. By doing so, Aztec Adventure gives you the sense that you’re exploring some forgotten part of the world, thus immersing you deeper into the game. The level design was a wise choice on Sega’s part. If the game had been a standard move-from-left-to-right, hop-and-bop platformer, it wouldn’t have been nearly as engrossing. 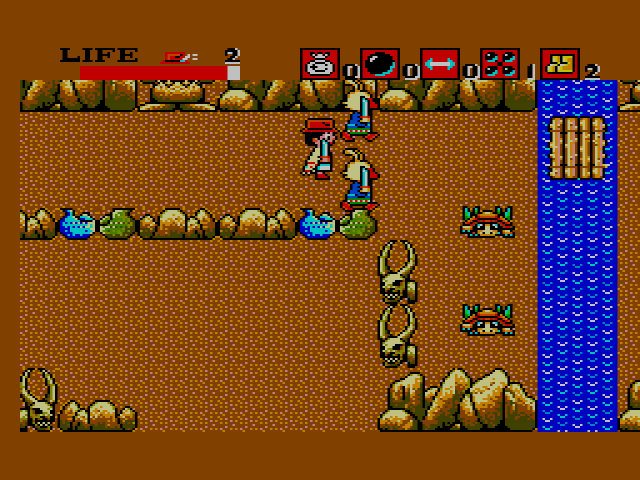 When Aztec Adventure begins, you’ll notice several icons on the upper right hand corner of the screen. Each one of these icons corresponds to an item that enemies drop after they’re killed. 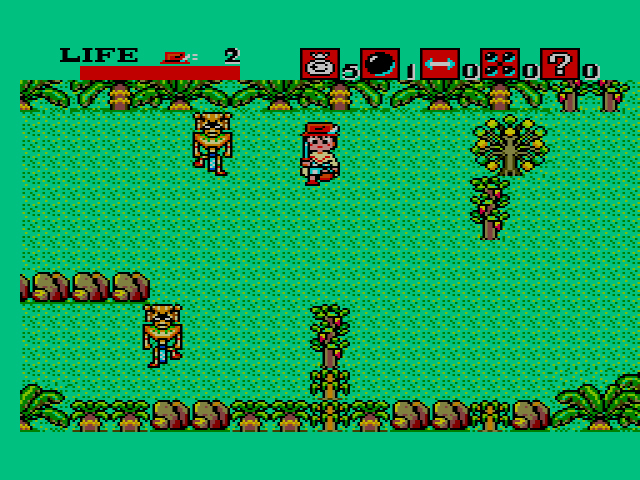 Many of the items are secondary weapons like iron balls used to take down large groups of enemies. Some items are level-specific, like the boots which allow you to cross water without taking damage. The money bags are probably the most important item, through, as they can be thrown at mercenary adventurers to persuade them to help you (and into wishing wells to refill your life meter – the only source of life in the entire game). These potential companions wander around in each level posing as enemies, though they don’t hurt you unless you start attacking them. When given the proper amount of money, they will follow you and mimic your movements until they get hit one too many times and die/run away. In certain levels, they’re useful for hacking through enemies. In other levels, they’re great to use as shields from projectile-spewing cacti and other such nonsense. Their AI is rudimentary (1987, lest we forget), but despite their limited skill set, they are the most fascinating aspect of Aztec Adventure and a large reason why the game remains interesting today. Three machetes for the price of several money bags. Aztec Adventure isn’t a full-on success – Nino is too slow, his machete doesn’t have a long enough reach, the companions are stupid at times, I could rant on – but the game managed to engage me, despite its flaws. The level design does an excellent job of drawing you into the game’s otherworldly landscape, while the companions are always fun to throw in harm’s way (their questionable intelligence finally used for the greater good). Thanks to the game’s insane difficulty, I never found Paradise, but that’s ok. A little taste of the adventure was more than enough to satisfy. That graphical style looks very pleasant! I might have to give this game a try. I actually got this game early on. Bought it home, played it a bit and took it back and got something else. Maybe I didn’t really know what I was doing. I couldn’t get past the first level. And there was another game I wanted more. To this day, I don’t remember any other game I’ve took back and exchanged before. So it sort of sticks out for me. I don’t know if it was a bad game? I just know that at the time it didn’t appeal to me. Maybe I would like it more now. Was it really that hard as I remember? I just felt lost and didn’t know what to do and kept dying. So back to the store it went. It’s definitely different, if you’re used to Sega’s arcade outings. Maybe your younger self just didn’t feel like another adventure game? Did you have the instructions? They definitely helped me. And yes, the game is ridiculously hard. I’m not sure how one would beat the game without the cheat code. I don’t even think I knew what an adventure game was. I’m pretty sure this was out before Zelda in the US. I wasn’t ready.